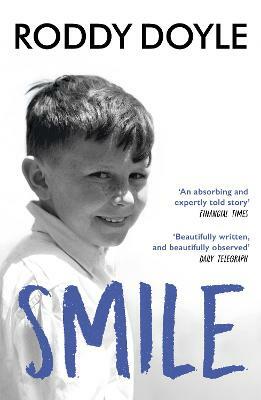 Smile has all the features for which Roddy Doyle has become famous: the razor-sharp dialogue, the humour, the superb evocation of childhood - but this is a novel unlike any he has written before.Victor dislikes him on sight, dislikes too the memories that Fitzpatrick stirs up of ... read full description below. Smile has all the features for which Roddy Doyle has become famous: the razor-sharp dialogue, the humour, the superb evocation of childhood - but this is a novel unlike any he has written before. When you finish the last page you will have been challenged to re-evaluate everything you think you remember so clearly. Just moved in to a new apartment, alone for the first time in years, Victor Forde goes every evening to Donnelly's pub for a pint, a slow one. One evening his drink is interrupted. A man in shorts and pink shirt brings over his pint and sits down. He seems to know Victor's name and to remember him from school. Says his name is Fitzpatrick. Victor dislikes him on sight, dislikes too the memories that Fitzpatrick stirs up of five years being taught by the Christian Brothers. He prompts other memories too - of Rachel, his beautiful wife who became a celebrity, and of Victor's own small claim to fame, as the man who says the unsayable on the radio. But it's the memories of school, and of one particular Brother, that he cannot control and which eventually threaten to destroy his sanity.